What was thought to be Springfield’s most disastrous fire ever, up to that point, demolished The Boston Store on the east side of the downtown square on Dec. 7, 1915. The Boston Store was part of a loosely affiliated chain of department stores, the local outlet of which was formally known as the McPherson & Edward store, 108-110 S. Sixth St. The partners, all local, were Alexander McPherson, Alexander Edward, George Wilson and Harry Swirles. Also heavily damaged were the adjoining Roland’s dry goods store and the Savoy Theater, owned by Gus Kerasotes. The first estimates of losses by all three businesses and the buildings they occupied came to more than $320,000, although the final figure was adjusted down to about half that amount. Customers and employees of the three firms escaped uninjured, thanks partly to quick action by a Boston Store elevator operator. Flames broke out, supposedly from defective wiring, in the basement and within 10 minutes the interior of the big establishment was a roaring furnace. Not a single article of value was saved, and clerks and morning shoppers were forced to crowd the exits to save their lives. Girls and women working on the second and third floors were, many of them, compelled to descend by means of fire escapes, so suddenly did the volume of smoke and flame burst upon them at their tasks. One girl, Rose Collins, 1410 E. Edwards St., leapt from the second-story to adjoining roofs in the excitement of the moment, but was not injured. The alarm was raised at 10:40 a.m. by Hazel Morrissey, who worked in The Boston Store’s basement china department, and then taken up by the elevator operator, according to the Illinois State Journal. Dallas Barton, employed as elevator conductor at the Boston Store, was among the first to see the flames. He ran the elevator to the top and at each landing shouted a warning. He carried a number of employees and customers to the first floor while those who were unable to get aboard the lift hurried down the stairways and fire escapes. Springfield’s entire fire department was called out to battle the blaze, which took 4 hours to get under control. The fire department headed by Chief (Peter) Jacobs was upon the scene in a short time, but the flames had gained headway and the belief was general that the stores of the E. side of the Public Square, some landmarks of almost a half-century, would be doomed. The firemen battled the flames until 2:45 o’clock in the afternoon when Chief Jacobs declared the flames were under control. When nightfall came, a steamer was pumping volumes of water into the ruins of the Boston Store, which a few hours before was one of Springfield’s leading business establishments. 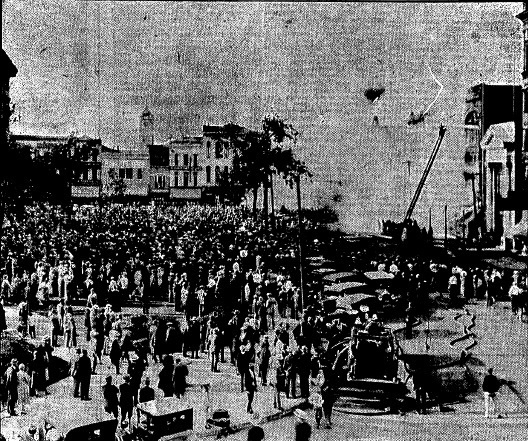 … The fire attracted thousands of persons who were spectators from the courthouse yard and from every viewpoint within a radius of 2 blocks. It was not without its thrills. In a short time after the firemen begin playing water into the basement of the Boston Store, there were crashes of falling fixtures and stock which broke the front windows of the establishment. On several occasions the firemen were driven back by clouds of smoke and flame. Although no one was seriously hurt, rumors were that several people were killed in the fire. Those stories may have been prompted by “wags” who picked up mannequins that had been blown out of the store’s display windows. In the course of the afternoon the display forms rolled about in the street and some joker notified the coroner’s office that several lives had been lost in the fire. On order of (Police) Chief (Wilbur) Morris, who could not see the amusing side of the stunt, the models were picked up and stored away, and policemen were placed on watch to see that the jokes were not repeated. The rumor that a number of persons had been burned to death in the store circulated with rapidity throughout the city. McPherson & Edward opened in 1885 on the south side of the square and moved later to the Sixth Street side, where it occupied two 20-foot-wide buildings. Store partner Alexander McPherson announced immediately after the fire that the store would rebuild; it reopened in June 1916 on the same site. In terms of property damage, The Boston Store blaze — final damage tally of $156,806 — compared to two fires that struck the Johnston & Hatcher home furnishings store on the southwest corner of Seventh and Adams streets in December 1907 and again in October 1913. Damage in the 1907 fire totaled $137,612. Final adjustments for the second Johnston & Hatcher fire, which damaged five buildings on the south side of the 600 block of East Adams Street, came to $182,970, more than the 1915 Boston Store blaze. All those fires, however, were eclipsed by the blaze that destroyed the Myers Brothers department store at Fifth and Washington streets in March 1924. Damage in that fire was finally calculated at nearly $400,000. The Bressmer Department Store fire, May 2, 1948, in the 600 block of East Adams Street. Damage was originally estimated at $2 million; later study put the final cost at $1.275 million. The Feb. 18, 1934, arson that destroyed the Illinois State Arsenal, Second and Monroe streets. Damage was put at $500,000. Investigators later found that the Arsenal fire was started by a 10-year-old boy who liked to watch things burn. The Aug. 17, 1917, blaze that consumed the Dome Building at the Illinois State Fairgrounds, at an estimated cost of $300,000. Also ranking high among damaging fires, however, was a blaze on May 23, 1926, that destroyed the Boston Store for a second time. This time, the store didn’t reopen. Its Sixth Street property was taken over by its neighbor to the north, Springfield Marine Bank. A list of the most costly fires in Springfield from 1904 to 1948 is here. This entry was posted in Buildings, Business, Department stores, Disasters, Fires, Uncategorized. Bookmark the permalink.